TEL AVIV, ISRAEL—Presenting the documents as proof that Iran entered the Joint Comprehensive Plan nuclear agreement in bad faith, Israeli Prime Minister Benjamin Netanyahu on Tuesday provided what he is calling “stunning new evidence” that Iranians planned the 539 B.C. sacking of Babylon. “This trove of recently uncovered top-secret information proves Iran is a dangerous nation that withheld key details concerning their sixth-century B.C. conquest of Mesopotamia during nuclear program negotiations,” said Netanyahu, who claimed Mossad agents infiltrated Iranian facilities to capture thousands of pages of charts, maps, and official correspondence detailing the nation’s clandestine efforts to overthrow the Ptolemaic Dynasty and subjugate the Cappadocians. 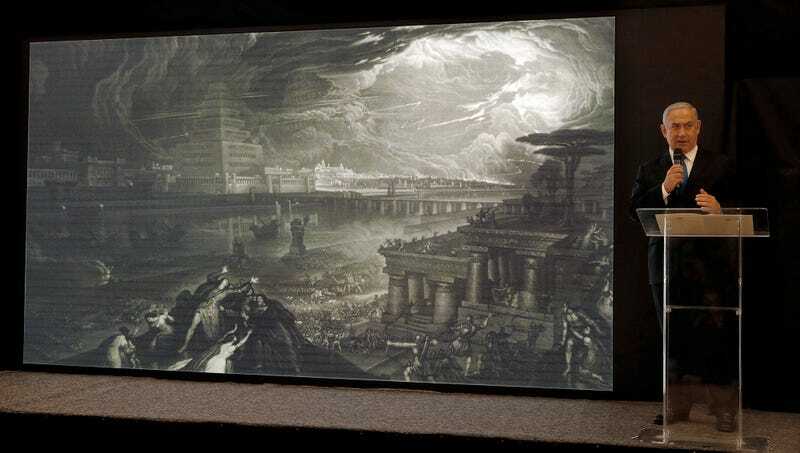 “The Iran nuclear deal’s framework is premised on misleading information—not only did Iran fail to mention attacking Babylon, but we also have proof that Xerxes I planned to cross the Hellespont in 481 B.C. to land 50 war elephants at Byzantium. Israeli intelligence has also obtained proof that thousands of spears and chariots were stockpiled for a surprise excursion into Parthia. As a result, we have no choice but to tear up the nuclear deal.” Netanyahu also claimed to have uncovered secret Iranian plans for the 1979 kidnapping of 52 American citizens.